While there are lots of sites that allow collaborative writing (including Zoho and PiratePad), I find trusty Google Docs (now part of Google Drive) to be the easiest and most useful–partly because of the clear sharing directions, and partly because so many people already have Google accounts. 1. If you don’t have one, open a free Google account. As always, you can choose how truthful you want to be with the info you give them. Google Account if you’re not automatically logged in already. 3. Click the big red “CREATE” button in the upper left of the screen, and then choose “Document” in the drop-down menu that pops out of it. Give the document a name by clicking “Untitled Document” in the upper left. Notice that you can link to any outside information the same way you add links in WordPress: by highlighting text and then clicking the image of a link in the toolbar. After you click Share, you’ll see a box with some options. Next to “Private – Only the people listed below can access,” click the “Change…” button. On the next screen, the easiest way to share your document is to select “Anyone with the link,” and then choose “Can edit” in the box that appears. 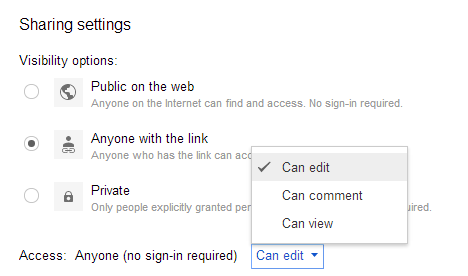 This way, your collaborator won’t have to log into a Google Drive account before being able to write in the document. Once you select the options you want, click “save” and you’ll be given a link to your document that you can send to anyone you want. The other option is that if you both have Google accounts, the person making the document can choose to keep the document private and give explicit permission to only the person invited. Sometimes the “invitation” stuff gets confusing when people use multiple email addresses, but you should be able to figure it out if you’d prefer to go this route. Once you start, Google Docs can get pretty addicting. I have docs that keep track of my address list, to list where I can get free stuff on my birthdays, to track what presents I give to family each year, to list what repairs are done on my car, to get advice from friends on my writing, and for various scholarly projects. Every time my wife and I go on vacation, we make a Google Doc (or 2) as a place to dump ideas and links for each other to look over later. Some of my docs are collaborative, but many are private–I write there so I can find my writing no matter what computer I’m at. If you prefer, RA3 can be completed the same way that your first two rhetorical analyses were: as a traditional essay posted on your blog. But if you like, I’m giving you two alternative ways to complete the assignment: collaborate with one other person or create a video analysis. The assignment is the same: the essay still must analyze the rhetorical strategies used on a Wikipedia talk page. You’ll still need to study the original assignment sheet carefully. The essay’s length and detail should reflect the fact that two writers were working on it. If necessary, the authors may choose to write about more than one talk page to find enough things to write about; however, if they use more than one talk page, the pages should be on similar topics. The total time spent planning and writing the essay should be the same amount of time spent if each student planned and wrote an individual essay. Both students are equally responsible for the entire essay. It will receive a single grade that will be applied to each student’s grade. If you know another student taking another section of RHET 351 from me this semester, you may collaborate with that student (if you get my permission first). Consider setting up a collaborative document that you can both edit whenever you like (like at Google Docs), as opposed to sending attached documents back and forth over email. UPDATE: I’ve written a blog post showing how to set up a collaborative doc. I love this page on Group Writing from the writing center at UNC Chapel Hill (@UNCWritingCTR). It might be worth skimming over it with your partner to see if it raises any questions you’d like to address together. This video will be assessed in the same four areas described in the main RA3 assignment sheet, with the style grade assessing your speaking voice–its clarity, liveliness, and suitability of word choice for a video’s audience. The video analysis may not be done collaboratively. If you use Camtasia, you can easily edit out moments where you mess up while recording. So if you make a mistake, you don’t need to stop your recording and start over; you can simply continue recording and edit out the mistake later. There are lots of good tutorials on how to use Camtasia; if you’re confused, read the software’s official documentation or just search Google or YouTube. I bet someone else will have had the same problem. You’ll want to plan your video extensively, including the big picture of what you’ll show when (to keep your viewers from getting bored) and the detailed picture of what you want to say. You may feel most comfortable reading from a script, or you might rather simply talk casually from an outline. Do whichever will make you sound the best (to keep your style score from suffering). Obviously, much of what the viewer sees will be the Wikipedia talk page itself. But to keep the video visually interesting, consider what else you might show to help you make your point. I use a free browser plug-in called Diigo to highlight text on webpages in different colors. If you want to highlight the text of your page, this might be a strong option. Consider what other creative ways you might emphasize your points (perhaps by zooming in and out or using other techniques). Remember that you can check out USB headsets from the library for 1 day, to be used outside of the library. Using a microphone will help your voice quality sound much stronger and clearer (helping your style grade). UPDATE: A scholar named Dan Anderson gives a screencasting assignment to his students, and he has lots of good advice on that page. I especially like his bulleted list of things you can show in a Screencast, like video of yourself typing, and his list of sample screencasts at the bottom. One commonly discussed aspect of the rhetorical situation for 21st-century communicators is our ability to collaborate. And over and over, you’ll hear these discussions return to the biggest collaborative writing project of them all: Wikipedia. Even though Wikipedia articles are supposed to be written from a neutral point of view–it’s even one of the site’s five pillars–a lot of persuasion is often needed behind the scenes to help an article achieve neutrality. After all, Wikipedia is a high-stakes writing space; the text that makes it onto a Wikipedia page has the potential to impact the thinking of millions of users over the years. Naturally, then, writers often feel strongly about the best ways to communicate an idea or fact. And they work out those differences through conversations on talk pages. Then write a rhetorical analysis of some of the arguments made on the talk page of your chosen Wikipedia article. As always, a rhetorical analysis describes how an argument was made, and it comments on those strategies’ effectiveness. The main difference from your last rhetorical analyses is that this time you’ll be analyzing the rhetoric of multiple writers in conversation with each other. This will give you a chance to compare and contrast some different techniques. Does one writer insist on using heightened, emotional language, while others repeatedly rely on facts? Does one link to Wikipedia policy while another tries to use basic logic as a source of authority? How else do the argumentative strategies differ? As you analyze these arguments, consider looking up what you know about those who are arguing. Have those writers made substantial changes on other Wikipedia pages? Were those pages on similar topics? As in the previous rhetorical analyses, you’ll write this analysis as a post on your blog, and your post will share many of the traits of an academic essay, including strong analysis, organization, details, and a confident written style. As part of your evidence grade, you must include a formal Works Cited or References section citing your Wikipedia page and any other source you summarize, paraphrase, or quote. If you don’t know how to formally cite a webpage, a good place to start is the Purdue OWL’s pages on MLA format and/or APA format. Instead of writing a traditional essay, you may choose to write this essay collaboratively or to make a video analysis. For details on the requirements for these alternative paths, see this post. As with your last rhetorical analysis, your essay will be graded in four areas: quality of ideas, organization, evidence, and style. (The same rubric will apply; the pdf is here.) But this time, the essay will count for 15% of your final course grade instead of 10%, reflecting the fact that by now you’re more of an expert on this kind of writing than you were earlier in the semester. We’ll do peer review in class on Monday, October 7. Come to class with a complete draft that you can share (either digitally or in print). Post your final draft to your blog before class begins on Monday, October 14. What to write about: Depending on the page you choose, you might choose to write about how the rhetor appeals to her ethos (her character as someone to be trusted), to logos (logical arguments and facts), or to pathos (emotions). Or perhaps instead you’ll base your analysis on some of the questions on this page about rhetorical analyses that we’ve used throughout the semester. 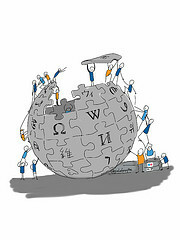 Talk page: If you’re confused about how talk pages are supposed to function, please read Wikipedia’s tutorial on them. Article traffic jumps sometimes imply that a page is considered important by many people, and thus those pages sometimes have busy talk pages. Other pages (like this article) describe the most popular Wikipedia pages, which again are sometimes more likely to have thriving talk pages. You might also consider trying the talk pages of controversial topics (like these). Or you could find a page related to your final project–perhaps a technology or writer that you see come up multiple times. Remember that none of the above places to look are guaranteed to have busy talk pages; sometimes a popular page has been visited so much that the major debates have already quieted down and the major arguments archived from the talk pages. The strongest rhetorical analyses make a claim about the effectiveness of the arguments being analyzed. Therefore, I recommend that you not just catalog the various moves made on your chosen talk pages but that you also assess their effectiveness. The Wikipedia page for “Lost (TV Series)” has a thriving talk page that nevertheless pales in comparison to the level of detail discussed at Lostpedia, a wiki dedicated solely to the show. I’ve made a video that walks you through the main issues I saw in RA1. It describes a primary and secondary issue for each of the four areas of the rubric (ideas, organization, evidence, style). UPDATE: Two sample essays are available in Moodle in the new “Sample Essays” folder at the top of our class page. We’ll discuss them in depth during week 6, but you’re welcome to read them over before then. Neither is perfect, but one is clearly stronger than the other. In his chapter “Semiotic Domains,” James Paul Gee writes, “I want us to think about the fact that for any semiotic domain, whether it is first-person shooter games, architecture, or linguistics, that domain, internally and externally, was and is designed by someone” (30). Gee’s emphasis on design overlaps neatly with the goals of a rhetorical analysis, which could be defined as an explanation of the way any piece of communication was designed to be effective in its particular rhetorical situation. Like Gee, I’m interested in videogames as sites for rhetorical analysis because they are examples of designed, multimodal spaces. (“Multimodal” means “uses more than one modality,” like sound, text, video, or image.) And one of the primary questions we’ll ask in this class is “How is multimodal rhetoric similar and different from written and spoken rhetoric?” Therefore, by analyzing the rhetoric of videogames, we’ll start to critically consider the ways these multimodal spaces are designed for rhetorical effects–that is, how they persuade. To make things easier, we’ll analyze games that were designed with very explicitly rhetorical goals. Specifically, we’ll discuss games at Games for Change (http://www.gamesforchange.org/play/), a site that indexes games that are designed for a “social good,” in the words of the site’s About page. Choose one game that is featured under the “Play” tab of Games for Change and write an essay that analyzes the game’s rhetoric. 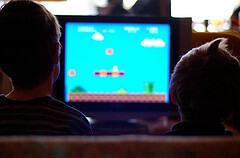 You must provide a link directly to your game the first time that you mention the game’s title, like this: “While playing Plague, Inc., I came to realize that….” You don’t need a Works Cited/References section unless you rely on material outside of your videogame (like an interview with the game’s creator). As with RA1, you’ll post your essay on your blog, but the content of your essay will still follow many conventions of academic essays. Once again, think of this assignment as a merging of the two genres: use strong organization, clear evidence, intriguing ideas, and sentences that are powerful and varied. Follow the grammatical and mechanical rules for standard written English, but feel free to write conversationally and use the first person. There is no length requirement. Write enough to reflect this assignment’s importance to your final grade (see “Assessment,” below). If you include an image, please be sure to crop it so that the screenshot focuses on the most important part of the image for your analysis. This assignment is worth 10% of your final grade. Your essay will be graded in four areas: quality of ideas, organization, evidence, and style. I’ll use the same rubric to guide me that I used for RA1 (pdf here). Post your completed essay to your blog before class begins on Friday, September 27. Strong Ideas Scores: The best way to get a good grade in the Ideas category is to identify a number of insightful strategies that you see the game’s designers using to convince you. It’s even better if you can articulate how those different strategies work together–that is, if you can explain the patterns you see in those how those strategies function as a whole. So a C- or B-level essay might list the strategies in a game (X kind of music, Y kind of visuals, Z kind of text), but an A-level essay would explain how all of those strategies fit together (to create an overall atmosphere of A, which was designed to help persuade players of B, the designers used X, Y, and Z). In what semiotic domains does this game seem to fit? 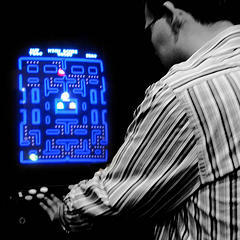 Does it rely on any common logics/grammars/systems that tie it to other games you’ve played? What affinity groups might be drawn to this game? Which wouldn’t? What modalities does the game use? Is one more privileged than the others? Gee’s concept of critical learning involves thinking about how a system was designed. Is there anything about the game’s design that allows or constricts certain kinds of actions? What do those design elements imply about the game? And like last time, for more general questions about rhetorical analyses, see “Basic Questions for Rhetorical Analysis.” You’ll see that some questions apply to this assignment more than others, but the list as a whole is excellent. I also write videogame as a single word, following the advice of The Videogame Style Guide and Reference Manual (pdf), published by The International Game Journalists Association and Games Press. But if you split it up (as many publishers do, including Gee’s), that’s okay too. After you receive a grade on a major essay (RA1, 2, or 3), you may revise that essay for a higher grade–after all, practicing effective revision is part of what this class is all about. When I receive your revision, I’ll average your original grade with your new grade. So if you earned a 70 on it the first time and revise to earn a 90, I’ll record an 80 in the gradebook in Moodle. You could copy the text of your original essay into a new post, revise it there, and email me with links to both posts. You could copy the text of your original essay into a word processor, revise it there, and email me a link to your original and attach a file with your new version. You could copy the text of your original essay into a word processor, save it for the record, and then revise the original post. (This keeps your best material and only your best material on your blog.) Then email me an attachment with the original copy and a link to your revised version online. Before submitting a revision, you must take your essay to either the Writing Center or the Center for Learning Strategies. I need to see documentation that this visit happened. In addition to the advice you get from them, you must incorporate any advice I gave (usually found in the Moodle gradebook). Let me also mention this: the most common choice students make when revising is to simply do a bit more proofreading, cleaning up commas and word choices here and there. These students usually only get another point or two for their troubles. To make this exercise in revision really worth it, it’s usually worthwhile to consider how to adjust major issues in the essay, perhaps by adding/deleting/moving paragraphs, writing entirely new pieces of evidence and explanations of that evidence, and completely rewriting introductions and conclusions. For more advice, check out this page on Revising Drafts from UNC Chapel Hill’s Writing Center. James Paul Gee defines multimodal texts as “texts that mix words and images” (17). But I think we can extend his definition and say that a multimodal text is any text that uses more than one modality, including words and images but also including audio and video (and more!). Clearly, composing content online makes it easy to compose multimodal texts. For example, because this blog is online, I can post both words and videos together to make my points, like in this post. My choice of how I choose to format my message is part of my rhetorical strategy. Your final project in this class will be multimodal. Therefore, it’s important that we practice using different modalities to prepare you for that project. In this brief assignment, the modality you’ll practice using is audio. As we’ll talk about in class on Monday, September 9, you’ll consider how an alphabetic text can be effectively turned into an audio text. Record your audio essay for an audience who has not read the text version of your rhetorical analysis. That is, you’ll have to introduce the essay you’re analyzing; you can’t assume your audience already knows what you’re talking about. You’ll also write a brief Statement of Goals and Choices, in which you’ll informally explain the goals you had in mind for this audio version and what choices you made to make it effective. This assignment will count as a 30-point grade in the Small Assignments category (1.5 times a reading response blog post). I will not be judging your ability to expertly record professional audio. That is, it won’t bother me if your voice recording sounds scratchy or if you make other small mistakes. We’re practicing. What I do expect is evidence of purposeful decisions. At every step, consider why you’re making the choices you’re making and what effect you want them to have. Ask yourself, “How is a listening audience different from a reading audience?” If it sounds like you quickly threw everything together or didn’t know why you made a decision, your grade will suffer. Your Statement of Goals and Choices is crucial, then: it allows me to see into your creative process and assess your work accordingly. Please put a lot of effort into it–it’s the best way to bump up your grade! Easiest way to record audio: Record yourself talking directly into Soundcloud. Log in, click “Upload,” then click “Start new recording.” Benefit: You don’t have to worry about recording a sound file and then uploading it. Everything is done on one site. Downside: You can’t edit your recording, so you need to get it right in one try. You have as many tries as you’d like, but you can’t cut out any parts where you may have messed up. You also need to have a computer with a built-in microphone or a microphone you can plug in. Second easiest way to record audio: Use your phone or a simple audio recording program (like Sound Recorder on Windows computers) to record your audio essay. This will give you a sound file (probably a .wav file), which you can then upload to Soundcloud. (Log in, click “upload,” and then “choose files to upload.”) Benefit: If you use a phone to record your essay, you’re not tied to a computer while you record. If you’re recording to the computer, you can save multiple drafts and decide which you like best. Downside: On a phone, you need to know how to find your recording and get that file onto Soundcloud, either through their app or by transferring the file to a computer. And you still can’t edit your recording. Advanced way to record audio: Use a free audio editing program like Soundation (entirely online) or Audacity (a program you install on your own computer or use in the Starr labs). Once you’ve edited your file to be exactly as you want it, you can export your file as a .wav or .ogg file, and then upload that file to Soundcoud. Benefit: You have the most control this way, plus lots of ways to make your audio sound better. You can also take the best parts from multiple takes and blend them into a single file, and you can delete awkward moments where you forgot your words or coughed. Downside: If you’ve never done audio or video editing before, these can take a bit of practice to get used to. You can absolutely do it (I’ve had students successfully use Audacity many times! ), but it might take some practice. 1. Copy the embed code of your newly uploaded file, which you’ll paste into a WordPress post in a moment. To copy the embed code, find your uploaded file in Soundcloud, click the “share” button beneath it, and highlight the text in the “Wordpress code” area (not the text in any of the other fields). Then copy that text the same way you would copy text from any other website. 3. Paste the embed code from Soundcloud into your post on WordPress at point where you want the audio file to appear. The code will look a little messy when you paste it in, but that’s ok. Once you preview or publish the post, it should look like my example post, with a big play button. T: 9-10:50 a.m. & 1-2:50 p.m. Rhetoric 351, Fall 2013 by Kyle D. Stedman is licensed under a Creative Commons Attribution-ShareAlike 3.0 Unported License.